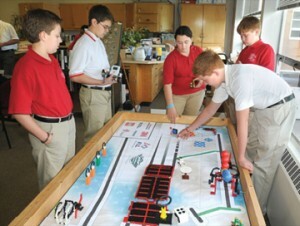 Students from Rome Catholic School study science and technology using LEGO robotics. Rome Catholic School also focuses on STEM-related fields of study and professions with its integrated robotics curriculum. Younger grades experiment with Lego simple machines and basic robotics, while Lego “NXT” Robotics are integrated in grades 5 through 8. For students looking for further challenge, Rome offers Lego Tetrix Robotics and programming as an elective in grades 9 through 12, and an after-school robotics program and Lego League Competition team is open to students in grades 6 through 8. In addition, Rome Catholic School also is at the forefront of providing cyber security, cyber forensics, Dimension M and other STEM-related opportunities within its curriculum. The school has partnered with the Air Force Research Laboratory’s Information Directorate in Rome, NY, as part of the National Defense Education Program (NDEP) to further enhance STEM skill sets in the areas of cyber security and robotics, and engineers with the lab have been working closely with the school’s faculty to ensure that technical areas are supported.